Stormshield is the ultimate all weather fabric, manufactured by Guilford Mills. Stormshield is made by taking polyester woven material, spraying molten acrylic foam, and elctro - flock microscopic cotton fibers onto it, producing a "peach fuzz" after cooling. There is no heat padding on the covers, which means you can not cover a motorcycle with hot exhaust pipes, you'll have to wait for it to cool down! 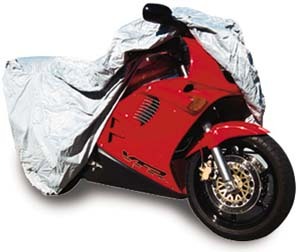 Motorcylcle covers are available in 5 sizes: MX-4 Bicycle or Moped, MX-3 Sub 500cc Motorcycle, MX-2 Super Bike, MX-1 Cruiser, and MX-0 Full dress Harley Davidson, with screen and bar.